Thanks for stopping by for another post, we welcome you warmly and hope you enjoy today’s read! Today’s post is dedicated to the naturals who have to do double duty– caring for and maintaining their hair while also treating a skin or scalp condition. 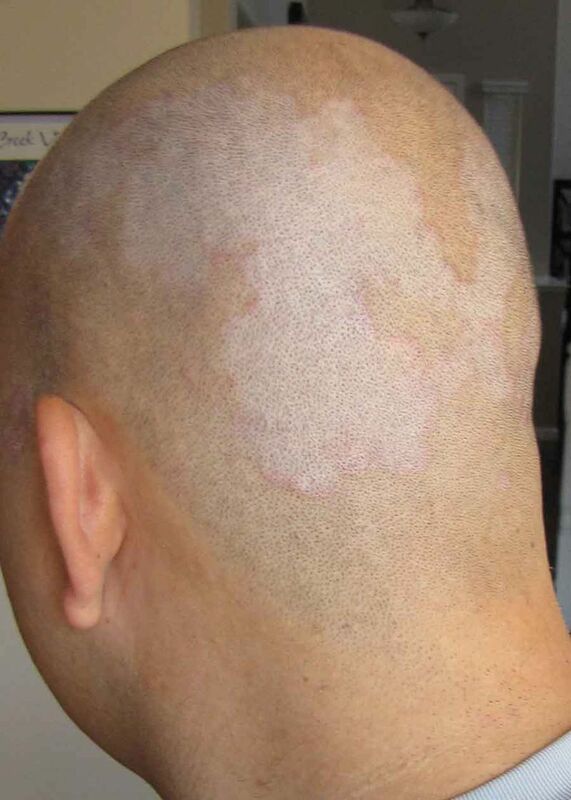 While there are many scalp conditions that can make growing and caring for your natural hair a bit more difficult, the focus of this post will be on a condition called Seborrhoeic Dermatitis (or SD). What is Seborrhoeic Dermatitis (SD)? Seborrhoeic Dermatitis is known to affect the areas of the body where sebum (your skin’s natural oil) is released, such as the folds of the nose, eyebrows, behind the ears, chin, scalp, genital area, etc. SD commonly manifests itself in the form of patches of dry, flaky, scaly skin that can range from super-dry to incredibly oily. The affected area can be very itchy, tender, swollen, bruised, and sensitive to external stimuli. There are many triggers that may cause SD to flare up, including stress, extremely dry or humid weather, excessive sweating, ingestion of certain foods, contact with common allergens (pollen, dust, pet fur, etc). Currently, there is no permanent solution to SD. The best thing to do if you suspect or know that you have this condition is to get referred to a good dermatologist to find out the severity of your individual case (severity varies between each individual); from there, s/he can prescribe you with medicated ointments, creams, shampoos to help you get the condition under control and to better manage it. However, if you’d prefer to get an over-the-counter remedy, there are many options available to you. In general, all of these shampoos are used to help relieve itchiness, lift and remove flakes, soothe the scalp, and reduce inflammation of the affected area. Now I’m sure you’re all asking the same question: What’s gonna happen to my hair? The truth is, yes, all of these shampoos will dry out your hair to a certain degree; moreover, it is recommended that you use these shampoos frequently to keep the condition under control (a naturalistas nightmare!) However, don’t fret, as there is a work-around that will keep your scalp happy, while also allowing your natural hair to thrive! Wet your hair and apply your conditioner before your shampoo– this will help minimize the drying effect of the medicated shampoo on your hair. 2. Take your medicated shampoo, rub it between your hands, and then massage into your scalp- just focus on getting the scalp. 3. Let the shampoo sit for several minutes to ensure that it penetrates your scalp. 4. Wash out the shampoo and conditioner. 5. Follow-up with a deep conditioning masque or treatment. 6. Apply your leave-in conditioner and then seal your hair with whichever oil you prefer. 7. Cover your head with a plastic shower cap or bag for 15 to 30 minutes. 8. Uncover your head and style your hair, as desired. On a final note, it’s important to be diligent and consistent when treating your scalp. Keep in mind that not every solution works for everyone across the board; so, yes, there will be a little trial-and-error involved in the process of finding the right SD regimen for you. Finally, don’t despair about the shampoo completely drying out your hair- it’s okay- as long as you focus on the scalp while washing and ensure that you replace the moisture in your hair, as instructed above. Getting your scalp condition under control is essential to your hair’s overall health and longevity- your hair’s home is your scalp– it can only be as healthy as your scalp is! So here’s to healthier scalps and optimal natural hair growth! Do you struggle to maintain your hair health due to SD or a similar skin/scalp condition? Let us know your story, techniques, and remedies in the comments! The Crown Was ALREADY Hers: A 2017 Natural Hair Win! Forgot to say thanks for the big up.